States and cities are taking the lead when it comes to banning rapid-fire "bump stocks" for guns after Congress has done nothing on the issue. Proposals to ban bump stocks — devices that turn a semi-automatic rifle into one that fires like a fully automatic weapon by using its forceful recoil to quickly re-engage the trigger mechanism — caught fire in Washington after reports that the shooter in the Las Vegas massacre had used them in his attack. Politicians from both parties, including Republicans often opposed to gun restrictions, said banning their sale should be seriously looked at. 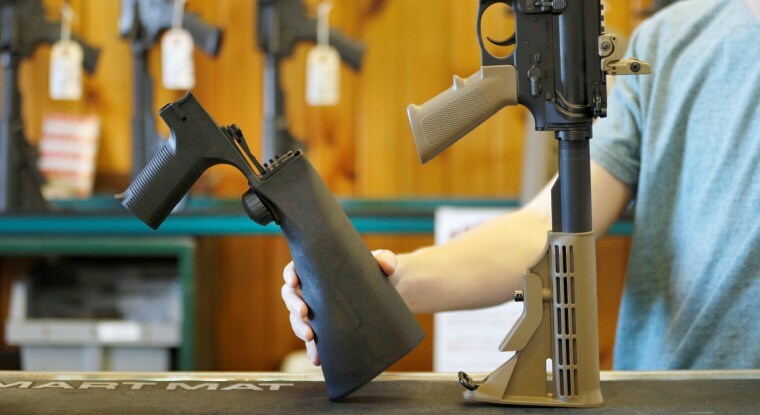 But nearly two months after Reps. Carlos Curbelo, R-Fla., and Seth Moulton, D-Mass., introduced a bipartisan bill to outlaw bump stocks nothing has happened. The National Rifle Association and some lawmakers said new restrictions on bump stocks shouldn't come from Congress, but from the the Bureau of Alcohol, Tobacco, Firearms and Explosives, although the agency had said previously that it didn't have the authority to regulate the devices. Infuriated by the inaction, states and cities have taken matters into their own hands. Earlier this month, Massachusetts became the first state to ban bump stocks after Las Vegas, and at least six other states are considering similar measures. Under Massachusetts' new law, those who use or possess a bump stock, or a similar device called a trigger crank, could face prison time. "We’ve come to the conclusion that Congress just won't act on this issue, gun control, so we've decided to try to do as much as we can on a state level and on a state-by-state basis," explained Massachusetts Democratic state Rep. David Linsky, who sponsored the bill. Linsky said he hoped Massachusetts could serve as an example, as states look to craft new, or tweak existing, gun laws. Prior to the Las Vegas shooting, California had been the only state to have explicitly banned bump stocks. Law enforcement officials in New York state, which does not explicitly ban of bump stocks, have said the devices are illegal under a statute that outlaws "any firearm or weapon simulating a machine gun." And laws in Minnesota and Michigan make illegal the conversion of semiautomatic firearms to fully automatic firearms, but do not explicitly ban bump stocks. After the Las Vegas shooting, several New York lawmakers introduced bills to explicitly outlaw the devices, and legislators in Pennsylvania, Maryland, Vermont, Hawaii, Maine and South Carolina are planning to introduce similar proposals in early 2018, according to the State Innovation Exchange, which tracks progressive state legislation. "Given continued Congressional inaction, it makes sense that states are taking the lead to curb gun violence and prevent further senseless tragedy," Sam Munger, the group’s director for strategic engagement, told NBC News. Cities have gotten in on the push, too. Last week, Columbia, S.C., Mayor Steve Benjamin proposed an ordinance that would ban the possession of guns with bump stocks or trigger cranks attached to them. "This is wrong in every sense," Benjamin, a self-proclaimed gun owner, said at a press conference announcing his proposed bill, referring to the devices. In an email to NBC News, Benjamin said he hopes his proposed local law can "demonstrate to America that there are constitutional and statutorily sound ways to lead and build consensus around practical solutions" on gun control. Gun control groups, frustrated with the longstanding stagnation in Washington, lauded the local and state efforts. "The states have proved time and again that when Congress won't act, they will," said Everytown for Gun Safety President John Feinblatt. Adam Skaggs, the general counsel for the Giffords Law Center, which is dedicated to preventing gun violence, said that state action can help fuel innovation and be a prototype for potential federal legislation down the line. "We have frequently seen states coming up with important solutions and innovations that could in the future serve as models for better legislation on the federal level," he said. Meanwhile, other gun control groups are taking the issue to the courts. The Brady Center to Prevent Gun Violence filed a class action lawsuit on behalf of the victims in Las Vegas against several manufacturers of bump stocks. The group is asking for compensation to pay for counseling for the victims' families, as well as punitive damages. Linsky, of Massachusetts, praised the group's move, emphasizing that gun control advocates must take advantage of all available avenues if they want to see anything change. "We just have to take the lead now, because there’s just nothing going on down there," he said, referring to Washington. "State legislatures, courts, municipalities, activists," he added. "That is where the action is right now in our current environment."